Drobo’s B1200i is a great value – lots of flexible storage at a great price. Performance is certainly good enough for backup and that was my intended use. I love the idea of being able to remove lower capacity disks and replace them with higher capacity disks in future as I need additional storage without having to destroy and re-create a RAID array manually. So I purchased two 27TB units (about 22 TB Usable after redundancy) for use as a destination for Veeam to backup my Hyper-V network. Prior to making this Drobo purchase, I was under the impression that iSCSI was a standard no different than USB or eSATA and that it wouldn’t matter if I mixed vendors or not. Apparently I was mistaken. The disk volumes represented by these LUNs never actually appear in the host operating system Disk Management console, meaning that you cannot actually use any of the storage on the Drobo on the same cluster node that is also able to communicate with the Dell EqualLogic equipment. A call to Dell’s tech support basically confirms this. If you have the Dell High Availability Hit Kit installed, you cannot use other SAN vendor’s equipment. There is a work around available that according to Dell would work: Uninstall Dell’s hit kit and go back to using the base Microsoft stack. However doing that will lower the performance of your Dell EqualLogic SAN so that solution isn’t really a solution at all. Another option: Since this is a Hyper-V environment, I could spin up a Hyper-V VM, and INSIDE THAT VM create a new iSCSI initiator that connects to the SAN fabric. But doing that won’t provide optimal performance and also risks causing different issues. I would either have to allow my iSCSI NICs to also be bound to a Hyper-V machine (which I really don’t want to try in a production environment) or I’d have to purchase another physical multi-port NIC, install that into the HyperV host, plug it physically into the iSCSI fabric and assign all of those NICs exclusively to this one VM. In the end I’ve decided to purchase a new 1U server install my Veeam backup software on that dedicated node and “not” install the Dell Hit Kit on that machine since that new node won’t be a member of the cluster. All in all, this was very disappointing. If you’re in a situation like mine, where you’re looking for very large, very affordable storage to backup your SAN, the Drobo is still a great solution, but only if you have a dedicated physical server that you can assign to the task of processing the backups. If any of you have tried some of these other solutions and got them to work please feel free to post your comments below. I’m not sure what’s different but I am able to connect to iscsi volumes on a Quantum RDX-8000 (JBOD RDX cartridges) on servers that also have HIT installed and are connected to a PS-4100 using MPIO. 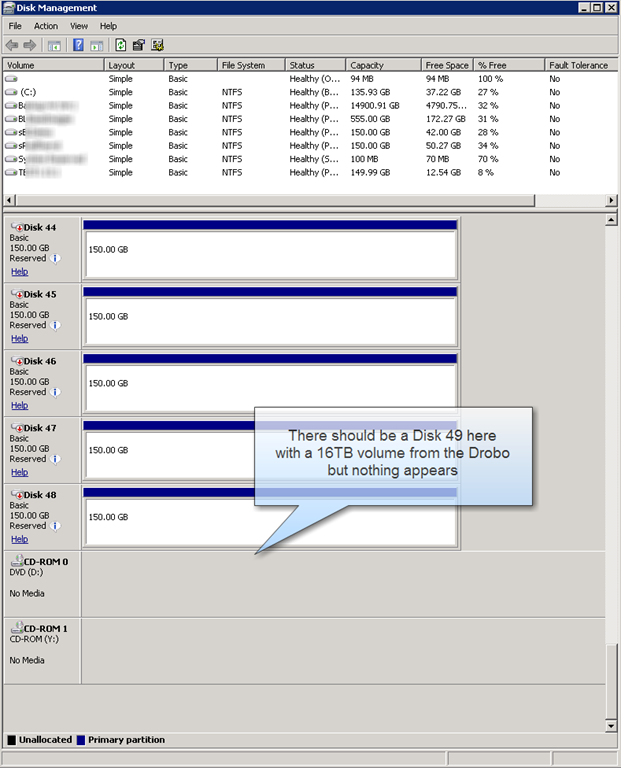 My RDX iscsi traffic is NOT using the same NICs as the Equallogic traffic. (it’s on a different subnet as well) so perhaps that has something to do with it?